The Ajuran are ethnically Somalis. They were a kingdom that ruled Somalia before the advent of Europeans into Africa. When the rest of the Somalis got fed up with their rule they took up arms against them in war popularly known as Eji iyo Ajuran meaning the rest of Somalis vs. the Ajuran. The wars that ensued deposed the kingdom and drove some of the Ajuran as far as where they live today in the North Eastern Kenya and Eastern part of Ethiopia. Some of those who settled in present day Kenya eventually adopted the language and customs of their neighbors and hosts, the Borana. The Ajuran are best known in Somali history for establishing the Gareen dynasty based in Qalaafo (now part of Ethiopia). The Gareen dynasty ruled parts of East Africa from the 16th to the 20th century. 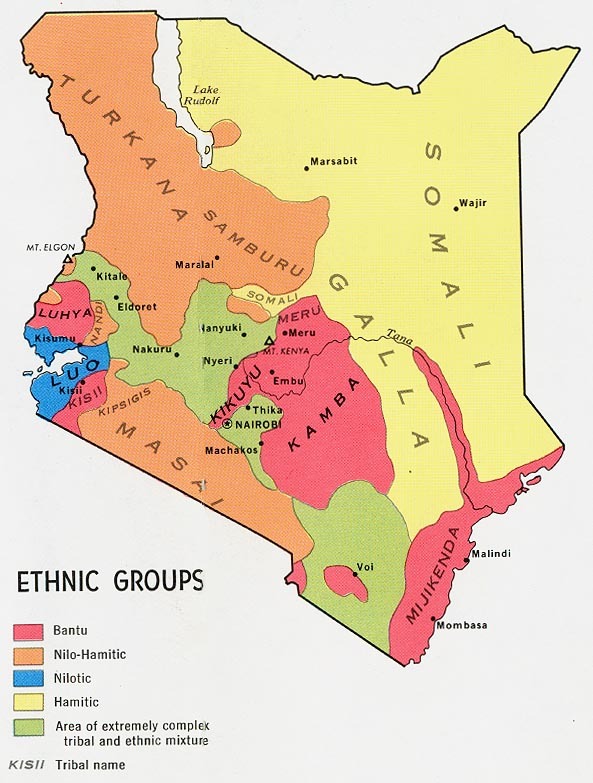 Among the Kenyan Ajuran people, the majority speak the Borana language as their first language while others speak the Somali language as their first language especially those from Wajir North District in the areas of Wakhe and Garren. It is vital to note that since Somali is the language of wider communication in Northeastern Province, even the Ajuran who speak Borana as their first language learn the language. The link between the Garreh and Ajuran is their primary language which is Borana and not Somali. The Ajuran live in northeast Kenya. The Ajurans, like the rest other Somali tribes of Northern Kenya have traditionally lived a nomadic life. This way of life is dictated by the climate which is semi-arid with two seasonal rains. They follow water and pasture for the animals they keep such as cattle, camels, goats, sheep, donkeys and mules that provide them their livelihood. Where the land is good for farming there are settled populations growing corn, millet, sorghum and some fruits and vegetables. The Ajuran live in an area with relatively high rainfall and good pasture for their animals. However, this blessing has on many occasions become troublesome to them in terms of marauding neighbors in need of the same resources. The intrusion by others has periodically resulted in clashes. Today, the Ajuran allow others to live and pasture their animals in their communal land. The Ajuran are nearly all Muslims. Although the Ajuran are staunch Muslims, few of them have a deep understanding of their faith. Muslims consider Jesus to be a prophet, a teacher, and a good man, but not God's son. They believe that they will be judged by their good works and by their knowledge of the Koran. Muslims say prayers five times a day while facing Mecca. Some of the Ajuran were displaced by civil strife in 1993 and live as refugees in the Moyale District according the UNHCR. They have since requested repatriation, claiming that there is now no ongoing fight with a neighboring tribe. * Ask God to send forth medical missionaries and supplies to help meet the needs of the Ajuran. 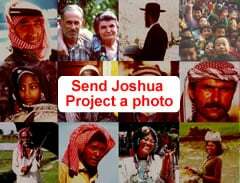 * Pray that the Lord will raise up additional missionaries who can effectively reach out to Muslims. * Ask God to anoint the Gospel as it goes forth via radio and television to the Ajuran. * Ask the Holy Spirit to soften their hearts towards Christians so that they will be receptive to the Gospel. * Pray that strong local churches will be raised up among the Ajuran.View Ajuran in all countries. 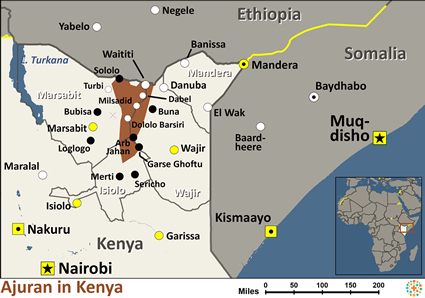 Location in Country: Marsabit, Wajir, Mandera, Isiolo, and Laikipia counties. Extensive area from Lake Rudolph east to Ethiopia-Somalia border, and south towards Nairobi.